My computer has an alarm set to ring every 50 minutes with a voice telling me to get up and work on my UFOs and other projects. Does it work? Yes, but I don't always listen to it. Taking a Master's degree and trying to do much else is a bit frustrating, but when my brain is overloaded, the sewing machine is good therapy! 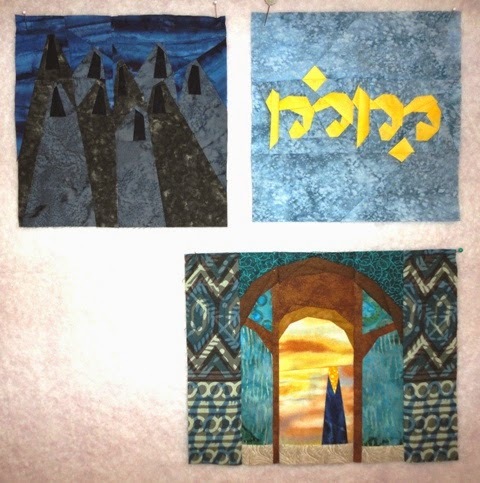 These are the latest three blocks in the Hobbit series. There are 29 of them, so I have 22 more to make. The one on the upper right could be upside down. I need to find an expert in the writing of those who live in Tolkien's world to be certain. My goal is one block a week, which seems easy, but I could use a 'personal assistant' to keep up with everything else that needs to be done. At least sewing these little guys is fun, mainly because I'm one of those quilters who likes foundation paper piecing. These are 7" finished, but I might leave the bottom one bigger. A few others are 11" and there will be sashing between... not picked the color yet.